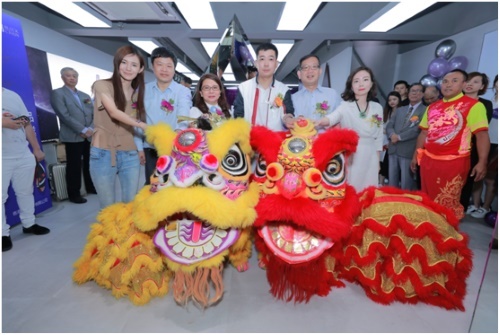 The management team of Triangle Technology chaired traditional eye-dotting and green-plucking ceremony of the lion dance to celebrate the grand opening of "31 BLOCKCHAIN" store. From Right to Left: Co-founder Ms. WANG Ke, CEO Mr. LIN Bing Hong, Founder Mr. GAO Shengli, Executive Director Ms. CENG Shu Fang, CTO Mr. FAN Qi Fei, and Retail & Franchise Director Ms. Mengdi JIA. 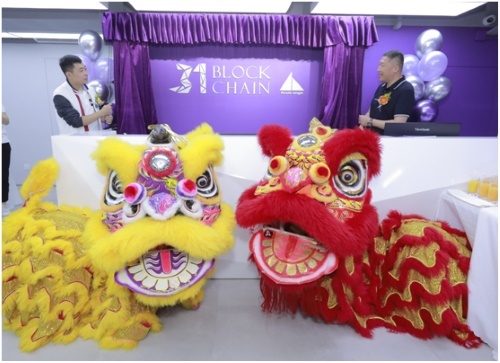 Mr. GAO Shengli, Founder of Triangle Technology and Mr. LIU Xiaodong, President of HC Group (2280.HK) chaired unveiling ceremony of 31Blockchain. HONG KONG, May 11, 2018 - (ACN Newswire) - 31BLOCKCHAIN, the world's first BLOCKCHAIN product brand, has finally arrived in Hong Kong. 31BLOCKCHAIN's hardware and related peripherals and accessories store in Wanchai is the first retail outlet around the world. 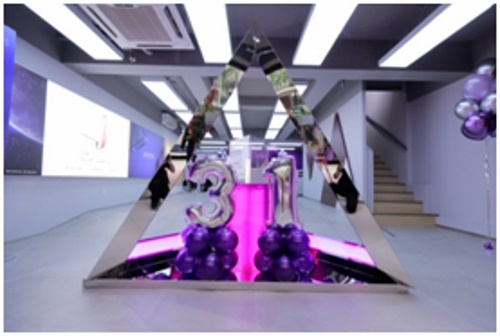 Apart from the proprietary iconic product Acute Angle PC featuring a triangular main unit based on Blockchain technology which has been a hit in more than 26 countries and regions, the store also offers a variety of ancillary blockchain products, transforming 31BLOCKCHAIN into a prestigious trendy BLOCKCHAIN product brand worldwide. 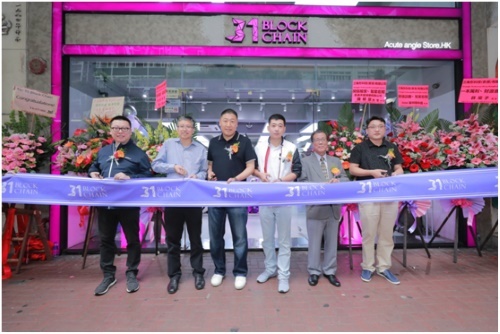 31BLOCKCHAIN has carried out external trial operation from 1-10 May and held a grand opening ceremony today. It will officially open for business on 12 May. A special introductory promotion offer was provided during the trial run period, in which a daily quota of the first 30 triangular main units were sold at a discount price of HK$5,380 (original price: HK$7,880). Each purchase was limited to two units and the quotas were filled virtually as soon as the offer was launched stirring up a shopping frenzy. 31BLOCKCHAIN is committed to creating a satisfactory service experience for customers and building the brand image as a trendy powerful blockchain product. 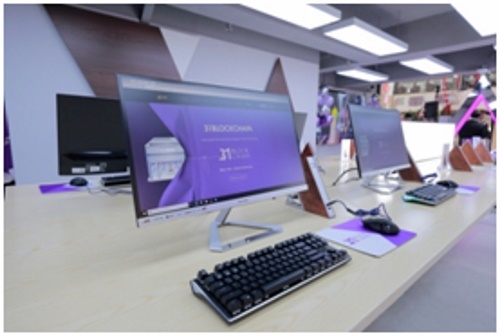 The store is currently offering blockchain application hardware products under the Acute Angle brand, blockchain peripherals under the 31BLOCKCHAIN brand and related consumer electronic products that meet the brand concepts. Accessory products to be launched in the future include shirts, cups and premiums with Bitcoin or e-money elements. 31BLOCKCHAIN brand has also established a one-stop consultancy service which provides customers with comprehensive product information including specifications and operation guidelines of Acute Angle's products and after-sales service. Customers can also appraise the product experience and services as well as access blockchain -related information through 31BLOCKCHAIN. Powered by Intel's latest Apollo N3450 14 nm quad-core microprocessor, the Acute Angle PC runs the Win 10 operating system and is equipped with 8+64G RAM and system storage. The main unit incorporates 128GSSD hard disk storage and supports 2.4G/5Ghz dual-band WiFi. Compared with a 20nm microprocessor with the same functions, the Acute Angle PC consumes 40% less energy and its light sleek triangular design also helps reduce its size60%, making it the new generation "green technology product". By adopting the BLOCKCHAIN technology, cloud computing and IPFS technology, Acute Angle PC can also realise a distributed IaaS platform which completely transforms the high maintenance cost operation model of the traditional centralized machine rooms by sensibly utilising idle system resources. The resulting benefits will be returned to the users. Acute Angle Chain enables the PC to contribute idle resources and offer a comprehensive and stable IaaS service. Users can integrate idle resources into the Acute Angle Cloud, which will then carry out automatic redistribution to enhance utilization rate of storage space and make the sharing of resources possible. It can also speed up the services provided by a series of innovative and practical big data platforms including a downloading platform, UGC acceleration platform, mobile media platform and dynamic acceleration platform. The service cost of using resources from Acute Angle Cloud is just one-tenth or even less than the comparable cloud service cost in the market. Acute Angle Cloud distributed cloud service platform is more secure, efficient and reliable and thus is considered as a highly cost-effective and innovative system solution alternative. The Acute Angle PC is also equipped with BLOCKCHAIN-based applications hardware. The idle computing resources including the broadband, storage, CPU and hard disk, which are idle or are not fully utilised, will be found and allocated when the users are operating their computer are that are linked in the Acute Angle Chain, offering these idle computing resources and are eligible for the reward scheme under the smart contract. The users can then participate in the designated official activities or duties to obtain reward tokens, which can subsequently be used to pay for transactions for storage space, information access and application development. With respect to the global pre-sale of 30,000 Acute Angle PCs via the official website, despite only a 12-hour limit and a single purchase restriction to five PCs for an individual, some 20,000 Acute Angle PCs were sold within just 19 minutes. The coverage of product delivery includes more than 26 countries and regions around the world. Mr. GAO Shengli, Founder of Triangle Technology, which owns the brand of 31BLOCKCHAIN, said, "Web 2.0 currently has many shortcomings, including vulnerability to attacks from hackers, leakage of personal information, abuse and wastage of abundant resources and expensive cloud service fees. Our 31BLOCKCHAIN team intends to explore new technology concepts, which have yet to be developed and applied, and to provide better software and hardware and BLOCKCHAIN-based solutions for society. We have selected Wanchai, Hong Kong as the location of our first product store in the world as we hope to promote Acute Angle PC?s service philosophy of trust, stable and security globally through the international and diverse stage and window of Hong Kong. Going forward, we will further introduce comprehensive service capabilities in our Acute Angle Cloud in order to offer the cloud users the CDN acceleration services, which better meet the needs of Internet business. Complementing these efforts, we will also further expand our BLOCKCHAIN-based and peripheral product offerings." Founded in 2015, Triangle Technology (HK) Co., Ltd is a state-of-the-art technology company focusing on BLOCKCHAIN-based software and hardware applications and pursuing diversification and innovation, and is the world's first provider of BLOCKCHAIN-based hardware solutions. 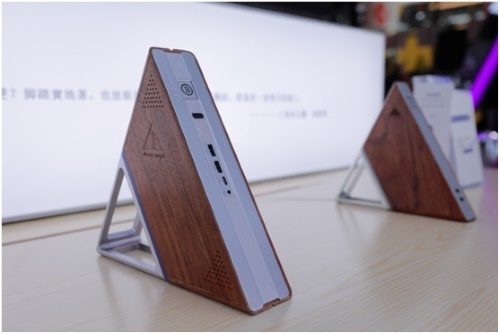 Triangle Technology has launched the first-ever BLOCKCHAIN-based Acute Angle PC. Through connecting the idle resources of global PC users, the Acute Angle Cloud enables the users to participate in the Acute Angle Chain reward scheme and it has successfully entered different countries and online trading platforms. The coverage of product delivery includes more than 26 countries and regions around the world.